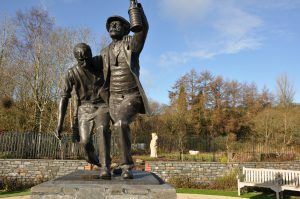 October 2013 saw the opening of the new Welsh National Mining Memorial and Universal Colliery Memorial Garden in Senghenydd. The central bronze sculpture entitled ‘The Rescue’ was designed and made by sculptor Les Johnson.. The ceramic name tiles for the Memorial Wall were made at a series of community and school workshops during November 2012. These were led by ceramic artists Ned Heywood and Julia Land from Chepstow and involved all the local Primary Schools of the Aber Valley. The ceramic paviers documenting each national colliery disaster in Wales were also made by Ned and Julia at their workshop. 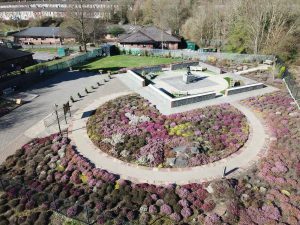 The Memorial Garden’s layout and planting scheme was designed by landscape architect Stephanie Wilkins. The Memorial Garden postcode is CF83 4GY. Please go to the how to find us page for further travel information. Last entry 15 minutes before close. Admission is free of charge to everyone. Donations are gratefully received and used for the maintenance of both the Museum and Memorial Garden, which are run by volunteers. Donations are also welcomed for family research requests. Please make cheques payable to ‘Aber Valley Heritage’. Theme Designed by InkHive.com. © 2019 Aber Valley Heritage Group. All Rights Reserved.